Pakistan made two key oil and gas discoveries in the third quarter and another three discoveries in the fourth quarter of 2017. These discoveries may have prompted the US-based Exxon-Mobil to join off-shore drilling efforts in Pakistan. American energy giant's entry in Pakistan brings advanced deep sea drilling technology, its long experience in offshore exploration and production and its deep pockets to the country. US Energy Information Administration (EIA) estimates that Pakistan has technically recoverable deposits of 105 trillion cubic feet (TCF) of gas and 9.1 billion barrels of oil. Exxon-Mobil is expected to accelerate exploration and lead to more discoveries and increased domestic oil and gas production. Russia led with 10 discoveries, followed by Australia with seven discoveries and Colombia with four discoveries. Pakistan and the UK each had three discoveries in the fourth quarter of 2017, according to Global Oil and Gas Discoveries Review. 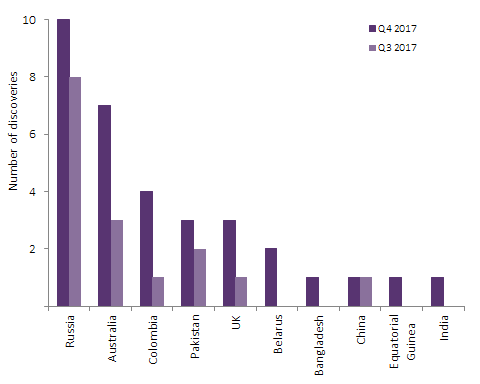 In fourth quarter of 2017, the Former Soviet Union leads with 12 discoveries, followed by Asia with eight discoveries, and Oceania with seven discoveries. Europe and South America had five discoveries each, followed by North America with two discoveries, while the Middle East and Africa had one discovery each in the quarter, according to Offshore Technology website. Each company will have 25% stake in the joint venture under an agreement signed at the Prime Minister’s Secretariat in May among ExxonMobil, Government Holdings Private Limited (GHPL), PPL, ENI and OGDC. The United States Energy Information Administration (EIA) estimates that Pakistan has 586 TCF (trillion cubic feet) of gas in Pakistan of which 105 TCF is technically recoverable. In addition to gas deposits, US EIA estimates there are 227 billion barrels of oil in Pakistan with 9.1 billion barrels being technically recoverable. Pakistan also has 185 billion tons of coal deposits in Thar desert which are just beginning to be extracted by Sindh Engro Coal Mining Corporation. Oil and Gas exploration and production companies are currently planning to drill 90 wells in different parts of the country. Under the plan, as many as 50 exploratory and 40 development wells would be drilled in a bid to make the country self-sufficient in the energy sector, according to media reports. During the last five years, the sources said the exploration and production companies drilled 445 new wells, out of which 221 were exploratory, adding that the increased exploration activities resulted in 116 new oil and gas discoveries. Energy imports make up a big chunk of Pakistan's total imports. Rising oil prices worsen the current account deficit and put pressure on Pakistan's reserves, forcing the country to seek periodic IMF bailouts. Pakistan’s current account deficit has jumped by 50% to a record high of $14.03 billion in the first 10 months of the current fiscal year 2018, according to the State Bank of Pakistan. The country imported $12 billion worth of energy in 2017. The bill is likely to grow with increasing demand and rising prices in 2018. Reducing energy imports by increasing domestic production will likely ease Pakistan's current account deficits and reduce its chances of going back to the IMF again and again. Pakistan made 2 key oil and gas discoveries in 3rd quarter and another 3 discoveries in the 4th quarter of 2017. These discoveries appear to have prompted US-based Exxon-Mobil to join off-shore drilling efforts in Pakistan. American energy giant's entry in Pakistan brings advanced deep sea drilling technology, its long experience in offshore exploration and financial resources to the country. It is expected to accelerate exploration and lead to more discoveries. US Energy Information Administration (EIA) estimates that Pakistan has technically recoverable deposits of 105 trillion cubic feet (TCF) of gas and 9.1 billion barrels of oil. Reducing energy imports by increasing domestic production will likely ease Pakistan's current account deficits and reduce its need to seek repeated IMF bailouts. To step up search for oil and gas in potential areas across the country, the government encouraged oil and gas Exploration and Production (E&P) companies by providing maximum incentives. Experts say the thrust produced satisfactory results. The exploration activities registered 80 per cent increase with 40 per cent success rate. Drilling of appraisal and development wells went up by 12.8 per cent, discoveries rose by 151.3 per cent, 2D and 3D seismic surveys increased by 37.2 per cent and 43.1 per cent, respectively. Consequently, domestic oil production grew by 29.8 per cent, meaning significant relief on the side of heavy oil import bill. A senior official in the Petroleum and Natural Resources Division told APP that during first four years of the PML-N government, the companies drilled over 179 exploratory and 194 appraisal wells that resulted in 101 new oil and gas discoveries, while the previous government had drilled 100 exploratory and 172 appraisal/development wells, achieving just 39 oil and gas discoveries. In the four-year span, more than 944 million cubic feet per day (mmcfd) of gas and 32,343 bpd oil were added to the transmission network across the country through indigenous resources. The country’s total crude oil production reached around 90,000 bpd oil. The official said 68 findings, out of total 101 discoveries, had added proven reserves of about 5.4 trillion cubic feet (tcf) gas, while calculations regarding 33 wells were yet to be determined. As many as 87 findings were made in Sindh, seven each in Punjab and Khyber-Pakhtunkhwa. During the same period, the country is estimated to have consumed about 5.2 tcf gas which means that more than 100 per cent replacement had been made for the resource consumed. Besides, over $10 billion foreign investment poured into the country’s petroleum sector, despite low oil price scenario in the international market. Determined to achieve self-sufficiency in the energy sector, the government also completed a study in collaboration with USAID which confirmed the presence of 3,778 tcf shale gas and 2,323 billion of stock tank barrels (BSTB) shale oil in place resources. Following which, a Shale Gas and Oil Centre has been established at the ministry to facilitate interested E&P companies in tapping the identified 188 tcf gas and 58 BSTB oil technically recoverable resources in lower and middle Indus Basin. Besides, a consortium of Oil and Gas Development Company Limited (OGDCL) and Pakistan Petroleum Limited (PPL) has been formed to undertake pilot project(s) to determine cost of extracting shale gas and oil. In a landmark development, Pakistan signed a 15-year agreement with Qatar for import of LNG to meet its growing energy needs as existing natural gas reserves were insufficient to bridge the ever-increasing gap between demand and supply of the commodity. The gas supply-demand gap has reached around 4 billion cubic feet per day (bcfd) as total gas demand of the country is 8.0 bcfd against total supply of 4.0 bcfd. Needless to say in winter, the demand rapidly increases. It is believed that LNG was the cheapest alternative fuel and the only instant available remedy to meet the country’s energy needs when the existing natural gas reserves were diminishing. Pakistan’s oil import bill rose nearly 30.43 per cent year-on-year to $12.928 billion in July-May 2017-18 owing to an increase in global prices of crude oil and rising demand of petroleum products in the country. The amount of the oil import bills is around one-third of the total import bill for the period. The trade deficit is widening as the overall import bill of the country has been on the rise since the start of 2017-18. The State Bank of Pakistan (SBP) on Wednesday showed the current account deficit at around $15.961 billion in July-May 2017-18 billion which surged by 43 per cent as compared to the previous year. Liquefied Natural Gas (LNG) imports rose by 84.5 per cent in the last eleven months of the current fiscal year to $2.123 billion as compared to the previous year’s gas imports worth $1,150 billion. Official figures released by the Pakistan Bureau of Statistics (PBS) on Wednesday showed that the petroleum imports increased 30.5 per cent year-on-year to $12.928 billion which was around $9.912 billion in the same period last year. A 60.35 per cent growth was recorded in the import of crude oil year-on-year to $3.738 billion. But in terms of quantity, a growth of 28.72 per cent was posted year-on-year to 9.45 million tonnes, indicating that a large share of the increase is on account of higher prices. Imports of petroleum products went up 9.54 per cent to $6.808 billion the eleven-month period. The petroleum products recorded a nearly negative 4.66 per cent in quantity year-on-year to 14.362 million tonnes. In the current fiscal, year the second-biggest component in the import bill was transport group whose import rose 27.88 per cent year-on-year to $3.821 billion in last eleven months of this fiscal year. The increase is due mainly to massive imports of busses/ trucks (60.8 per cent), and motor cycle (57.88 per cent). Addressing business leaders at the Federation of Pakistan Chambers of Commerce and Industry (FPCCI), the minister said that ExxonMobil — an American multinational oil and gas company — has so far drilled up to 5,000 meters close to the Iranian border and is optimistic about the oil find. The Government of Pakistan, he said, has already taken an undertaking from the company to set up a generation complex worth $10 billion. The government is also encouraging Chinese and Western investment in the country, he added. He further said that there is a need to integrate the Karachi Port and Port Qasim so that they could supplement each other in the larger interest of the country. On the occasion, he said the Pakistan National Shipping Corporation (PNSC) has sufficient funds for purchasing two vessels but this will be done by next government. The minister said that there is greater need to have new area for fish harbour because the existing one has many issues and there is shortage of land. However, he regretted that the harbour is not well kept and hoped that the European Union (EU) will give subsidy for new fish harbour. “Foreign investors are interested in coming to Pakistan, provided we manage to meet their standards and attract them to make investment,” he stressed. The minister advised that ports should be developed so that they could meet the country’s demand on the basis of its markets and products and fully supported the Karachi Port Trust (KPT) development projects highlighted by KPT Chairman Admiral Jamil Akhtar. KARACHI: The US energy giant ExxonMobil is close to hitting huge oil reserves near the Pakistan-Iran border, which could be even bigger than the Kuwaiti reserves, says Abdullah Hussain Haroon, Pakistan’s caretaker minister for maritime affairs and foreign affairs. ExxonMobil, the American multinational oil and gas company, has so far drilled up to 5,000 meters close to the Iranian border and is optimistic about the oil discovery, Haroon told business leaders at the Federation of Pakistan Chambers of Commerce and Industry (FPCCI). If the oil deposits are discovered as expected, Pakistan will be among top the 10 oil-producing countries ahead of Kuwait in sixth position. Kuwait’s oil reserves make up 8.4 percent of the oil reserves in the world. Kuwait claims to hold about 101.50 billion barrels, including half of five billion barrels in the Saudi-Kuwaiti neutral zone which Kuwait shares with Saudi Arabia. According to current estimates, 81.89 percent of the world’s proven oil reserves are located in OPEC member countries, with the bulk of OPEC oil reserves in the Middle East, amounting to 65.36 percent of the OPEC total, latest OPEC data shows. Pakistan’s foreign minister also said that his government has already taken an undertaking from ExxonMobil to set up a generation complex worth $10 billion. “They are also putting up an LNG berth at Port Qasim, the second seaport in Karachi. They have already paid for the drilling rights in Pakistan,” Haroon added. In May 2018, the ExxonMobil had acquired 25 percent stakes in offshore drilling in Pakistan. The agreement was signed at Prime Minister’s Secretariat among ExxonMobil, Government Holdings Private Limited, PPL, Eni and the Oil and Gas Development Corporation. The agreement has reduced the drilling share of other partner exploration companies to 25 percent each. “When we sought a much-needed external loan from China, which they initially had refused, the US expressed its annoyance,” Haroon added. Pakistan currently meets only 15 percent of its domestic petroleum needs with crude oil production of around 22 million tons; the other 85 percent is met through imports. The country facing huge current account deficit of up to $18 billion is spending a substantial amount of foreign exchange reserves on import of oil. The import bill of Pakistan rose by to $12.928 billion in the July-May 2017-18 period of the last fiscal year. Pakistan’s foreign minister also talked about the current water crisis and its impact on Indo-Pak relations. “India is acting to control water flows which would endanger Pakistan’s food security and they would ruin our crops,” he said. Haroon called for the integration of Karachi Port and Port Qasim so that they could supplement each other in the larger interest of the country. In Pakistan, ExxonMobil signed an agreement in May this year to take a 25-percent working interest in the Indus Block G offshore Pakistan, where the other partners in the block are Italy’s major Eni and Pakistan’s Government Holdings Pvt Ltd and Oil and Gas Development Company Limited (OGDCL). According to Arab News, Pakistan currently meets just 15 percent of its petroleum demand with domestic crude oil production, while 85 percent of its demand is met with imports. With the high imports, and the higher oil prices in recent months, Pakistan faces a large current account deficit and spends a substantial portion of its foreign exchange reserves on importing oil. Italy's ENI has acquired a 25% stake and operatorship in an ultra-deepwater block off Pakistan. Block G in Pakistan’s Indus Basin comprises approximately 7500km2. Eni currently holds participating interest in adjacent Indus block C (60%) and block N (70%). The Oil and Gas Development Company (OGDC) on Friday said drilling in its ultra-deepwater offshore block is expected to start next year as the company has completed seismic work. 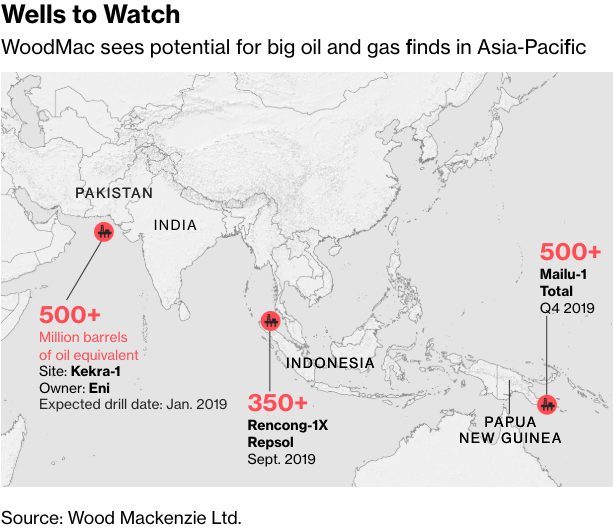 “… work on ultra-deepwater offshore well has been approved and the rig has been arranged, where work will start from January 2019, which will take about 4-5 years to develop,” a senior company official said at analysts briefing. The briefing as arranged after an announcement of the company’s financial results for the year 2017/18. Industry officials said a joint venture comprising OGDC, Pakistan Petroleum Limited (PPL), ENI and ExxonMobil, have planned drilling of the first exploratory well Kekra-1 in offshore Indus G-Block with a total investment of $70 million. Pakistan’s oil and gas sector witnessed a major development recently when the world’s largest energy company ExxonMobil acquired 25 percent stake in Pakistan’s offshore Indus G block. This development could be seen as a major breakthrough as it might lead other international energy firms to bring foreign investment in Pakistan’s energy sector. Indus G block is approximately 7,500 square kilometres located in ultra-deep water offshore Pakistan. ENI is the operator of the block. OGDCL officials said Tal block pricing case is in the court and the new government is willing to discuss all existing issues. The issue is expected to be settled in FY19, they said. OGDCL sees stagnant growth in gas production as “a challenge”. In the next two years, the OGDC should be able to come up with 150mmcd of gas. “With natural depletion and incremental gas production, the company will be able to sustain its gas production at current levels going forward,” the company’s official said. Profit of the company increased 23 percent in the year ended June 30, 2018, compared with the preceding year. This was on the back of higher crude oil prices and growth in sales. Oil price hike and rupee depreciation lifted profit of Oil and Gas Development Company Limited (OGCL) up a decent 23 percent at Rs78.736 billion during the financial year ended June 30, translating into earnings per share (EPS) of Rs18.31. OGDCL’s profit amounted to Rs63.803 billion with EPS of Rs14.83, the company said in a filing with the Pakistan Stock Exchange. The company announced a final cash dividend of Rs2.5/share, taking full-year payout to Rs10/share. Overall receivables due to circular debt have increased, but at the same time, cash position of the company has strengthened. Brokerage First Capital Equities Limited said sales jumped 19 percent to Rs205.335 billion in FY2018. Benchmark Arab Light oil prices advanced 28.4 percent to average $62.3/barrel in FY2018. Rupee depreciated around five percent during the financial year. Sales increased despite falling hydrocarbon volumes during the year. “Exploration expense came in at Rs16.19 billion above our forecasted figure of Rs14.94 billion due to recording of a previously-suspended well at Ranipur, while quantum of other income stayed at the previous year’s level,” First Capital Equities said in a flash report. OGDCL said the company recorded significant increase in seismic efforts and drilling activities during the year. The company paid Rs33.890 billion on the account of taxes. Analyst Ahsan Arshad at Taurus Securities exploration cost rose 22 percent year-over-year as the company booked 11 dry wells as against four dry wells in the corresponding year. Analyst Aftab Awan at Sherman Securities said the gross margin of the company improved to 59 percent in FY2018 from 55 percent in FY2017 mainly due to improved oil and gas prices and reduction in operating costs.